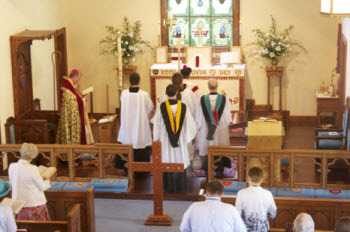 At St. Stephen's, our central act of worship is the Celebration of the Holy Communion, also known by terms such as the “Mass” and “Holy Eucharist.” During this sacred celebration, we believe that our Lord Jesus is truly present on the altar as the words, “this is my Body and this is my Blood” are spoken by the priest. Holy Communion is offered each Sunday at St. Stephen’s at 9:00 a.m. & 11:00 a.m. There is also a service of Morning Prayer with Lessons, Psalms, and Prayers offered at 8:30 a.m. The 9:00 a.m. service is a quiet, contemplative service with Holy Communion and sermon, but no music. It follows the outline in the 1928 Book of Common Prayer, which is located in your pew. The 11:00 a.m. service is a sung Holy Communion, often referred to as a Sung Mass. It too, follows the basic prayer book outline, but adds prayers from the Anglican Missal. Chanting, Bells, and occasionally incense will be used during this service. Hymns and music for the various parts of the Mass are sung by the congregation and the St. Stephen’s choir. As the Pro-Cathedral for the diocese, we also offer weekday Holy Communion Tuesday-Friday. These services normally last about 30 minutes and service times vary. Please check the calendar on this website for current days/times. Evensong. At various times throughout the year, the St. Stephen’s choir will offer the service of Evensong. This is a sung service of Psalms, Readings, and additional choral selections. This is a beautiful service and heavily attended by non-members from our community as well. Ordinations. As the pro-cathedral St. Stephen’s is privileged to witness the ordination of men to the Sacred Order of Deacon and/or Priest. These men come from all over the south and following ordination, are assigned to a parish by the bishop. Parishioners are invited and encouraged to attend the ordination Mass. House Blessings. One of our most popular services is the blessing of homes. Whether you are moving to a new dwelling or want your current residence blessed, simply contact the church office to arrange a time with the rector. During the blessing, the priest offers prayers to banish evil and bring peace and tranquility to the home’s inhabitants. Each room is sprinkled with Holy Water while prayers and Psalms are recited.